Every year we try and impress our college campus with an original and unexpected costume for Halloween. 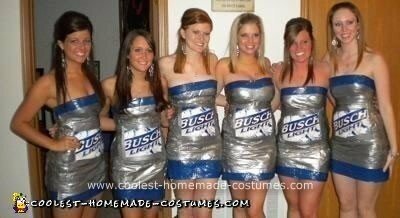 This year we got the idea to make ourselves a Homemade Six Pack of Busch Group Costume. Our entire costume cost under $10 a piece, a steal compared to those who spend over fifty for a crappy costume. We used a plain black garbage bag and held it around our bodies while another person wrapped duct tape around us so the outfit was form fitting. The first layer of duct tape was just to make sure it was tight, the second layer was to make it smoother looking. Then we cut the duct tape dress down the side, added another couple inches to the side and attached Velcro so we were able to re-use the costume (and able to use the bathroom). Then we put a row of duct tape at the top and the bottom and cut a slit in the back so it was easier to walk. The first few tries went a little badly, but we got them right on the third try and they took about an hour or less to make each one. The girls that weren’t working on the dresses were creating pop-tab jewelry. We each had a set of earrings, a bracelet, and a necklace, all made of pop-tabs and very thin wire. Our costumes were a big hit. Everywhere we went people loved them! They are going to be hard to top for next year. How did you put the labels on? We were thinking clear packing tape. Also, where did you get your large beer labels from? Are they from a beer box? How did u get busch light labels?? @Anonymous–they probably printed the Busch logo off the Internet, and then enlarged it. Is that right? How did you attach the Velcro?